It is said in Ireland that the only constant when it comes to the weather is change. The country's temperate climate means rain can fall at any time of the year - most of the time it's not a problem, we just get on with it, umbrella in hand. But there are times when a day of guaranteed sunshine, would for some, be the icing on the wedding cake. No bride wants her big day ruined by a downpour - plans for scenic outdoor pictures hastily abandoned as the wedding party takes cover inside the hotel's dry, but drab, interior. It's no wonder that some people are willing to put their faith in a statue of a child Jesus that is believed to guarantee good weather for special occasions. Michael Kelly is editor of the Irish Catholic newspaper. He said few Irish Catholic weddings are complete "without at least a nod" to the statue of the Child of Prague. "For as long as anyone can remember, it has been considered a tradition to place the statue in the garden in the hope of gaining some divine assistance for good weather on the big day," he said. "I was a guest at Áras an Uachtaráin in Dublin (Irish president's residence) a few years ago shortly before the marriage of President Mary McAleese's daughter and the president was sure that she was going to place the statue in the garden." On a sunny day, I set off in search of such a statue. Damien Duffy is the owner of the The Holy Shop in Belfast city centre. Among the Mass cards and religious relics I spot the Child of Prague. He says it's a very popular item. "There tends to be more weddings in the summer so that is when we sell the most," he said. "I don't know where the tradition came from but we get a lot of mothers of the bride coming in, who are more in tune with this old tradition. "If the head breaks off the Child of Prague, it is considered to be very lucky. "Some people bury the statue in the garden, others place it in the window of their home facing out." The statue is not only associated by Catholics as bringing good weather. "We also have Protestants who come into the shop to buy the Child of Prague statue, they're also buying it in the hope that it will bring them good weather for a special event," said Mr Duffy. "It is not the only statue that is supposed to bring good luck. "Some people bury a statue of St Joseph upside down in their garden, to help them sell their homes. "Others plant the miraculous medal in the gardens of the house they hope to buy." It seems it is not only brides who are willing to place their faith in the Child of Prague statue. Ferghal Purcell is general manager of the Lough Erne Resort in County Fermanagh. His staff are busy preparing the hotel as the host venue for the G8 Summit on 17 and 18 June. While the leaders' of the world's most industrialised countries will be assured a warm welcome, there is no guarantee that the weather will be equally pleasant. "We are hoping for a little divine intervention to ensure the sun shines down on the resort for the duration on the summit," he said. "It is a great opportunity to showcase the resort in its best light and some sunshine would be the icing on the cake." So how did a statue whose origins lie in a former Communist country become so popular with Irish Catholics? 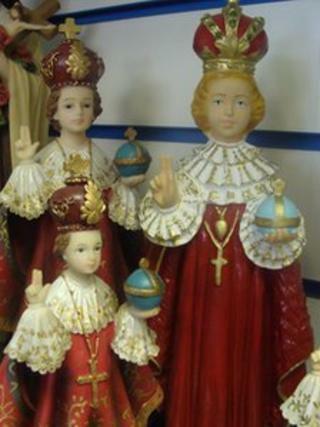 "The statues that people have are a replica of a 16th Century statue of the child Jesus holding an orb," Mr Kelly said. "It is housed in the Carmelite Church of Our Lady Victorious in Prague." He said Catholicism, and particularly Irish Catholicism, is a "gritty, rooted-type of spirituality". "Traditional Irish Catholicism is very rooted in the world around it," he said. "I've never heard of placing the statue in the garden for anything other than good weather for a wedding. "That being said, with the G8 Summit the best chance Ireland has had in years to show off our the natural beauty of our countryside, and good weather being in such short supply, I'm not surprised we're turning to prayer in the hope of divine intervention." BBC Northern Ireland weather presenter, Barra Best said if "only it was that easy to guarantee good weather". "Unfortunately Ireland's position means it is first in line to get hit by weather systems bringing unsettled weather from the Atlantic. "That's said, let's hope the current good weather is here to stay. "Goodness knows, after one of the coldest springs in living memory, we deserve it." For the devoted, a little bit of faith in the statue's powers can lead to a successful outcome. "My mum placed a statue of the Child of Prague in the window for my sister ahead of her wedding and it proved successful, so who knows..," Mr Duffy said. "But if there are no miracles, I'm afraid I can't offer any refunds."